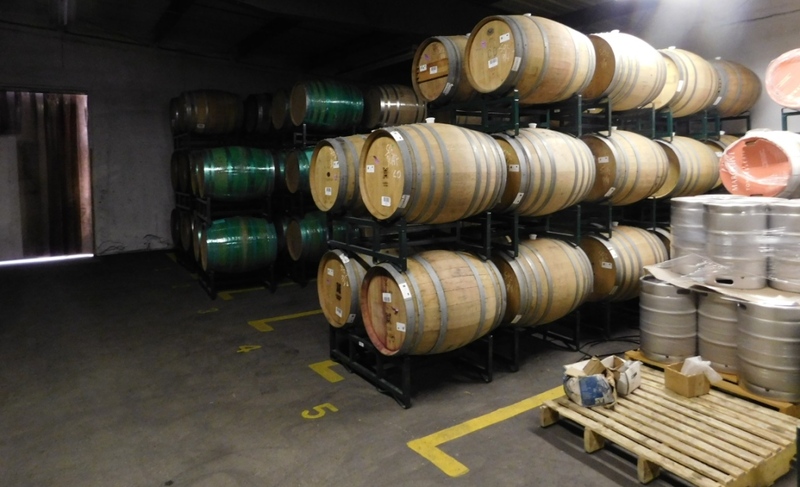 Cold storage can be such an amazingly valuable tool for the winery and growers. While on the vine grapes are naturally protected from microbes such as yeast and bacteria. Once they are picked time is of the essence to cut down on exposure, which is why most growers pick in the early morning hours (or even at night under lights). Assuming everything goes according to plan the fruit will be delivered to the winery, get processed, and end in a fermentation vat while still cold. But, in the world of wine grapes and the winery – things often do not go according to plan. This is where cold storage can save the day. Grapes undergo the sorting process better when they are cold. This is because the fruit is denser, allowing the berries to stay more intact throughout the sorting and destemming process. 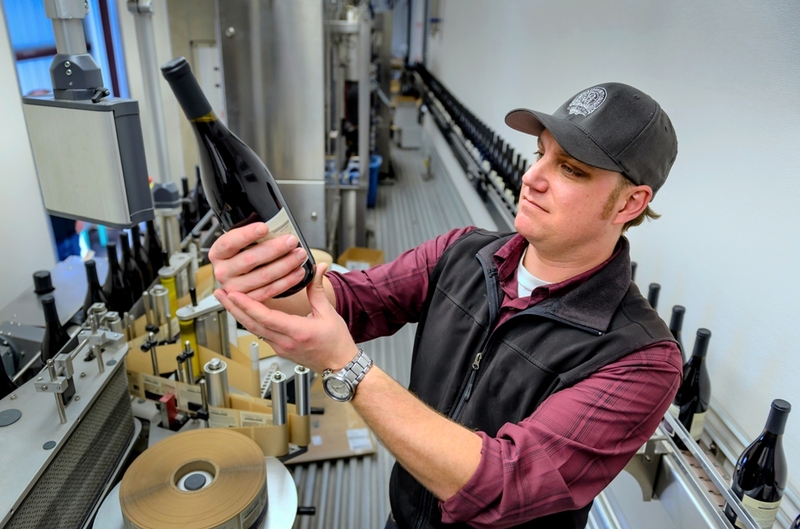 This is especially crucial for quality reds, like Pinot Noir, when the winemaker wants the grapes whole and intact as it can lend to more fruitiness and limit harsh tannin extraction. High-end sorting equipment, such as the optical sorter we have at Naumes Crush, also works better with whole berries. 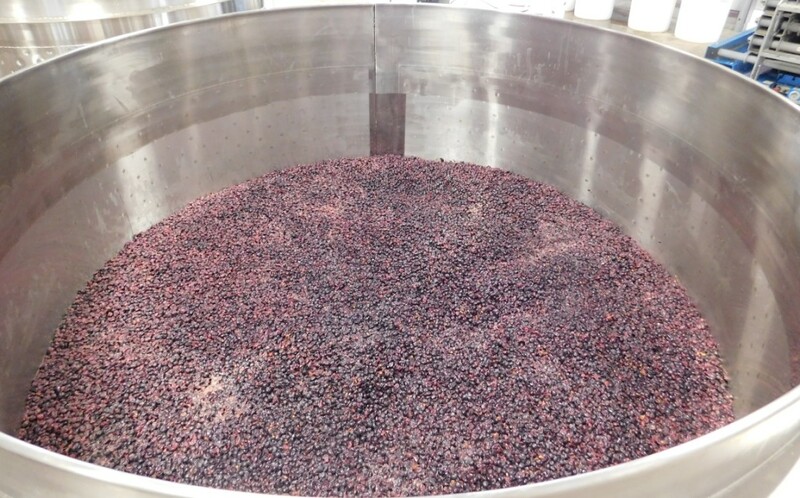 Most often with red winemaking, the winemaker will want to keep the must in the fermentation vat cold for a period of time prior to the fermentation. 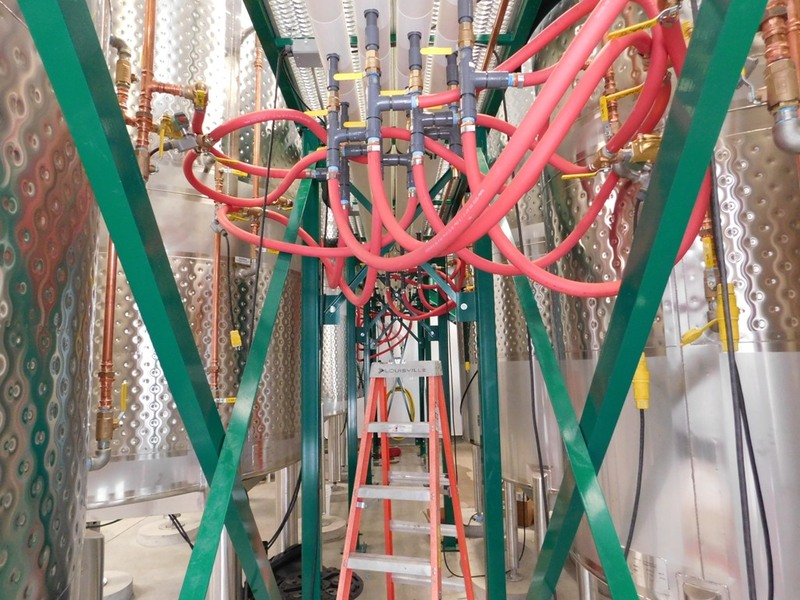 This is called a “cold soak.” If the fruit arrives at the winery warmer than ideal, not only will the destemming and sorting be less effective, but attempting to cool down the must and hold it cold is very difficult, thereby shortening the duration or limiting the cold soak option altogether. 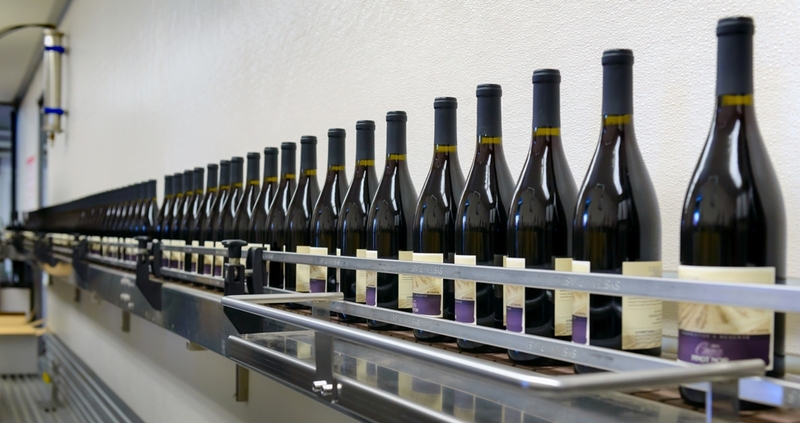 Cold storage can buy the winemaker time. Cold storage can chill the grapes for better processing and cold soaks. As a custom crush facility, coordinating with the clients and their picking crews can be very challenging. Especially if there is a rain event on the forecast and lots of fruit needs to come off the vines. Utilizing cold storage, all picks can be received and tucked away into cold storage and processed within a day or two, while resulting in higher quality destemming, sorting and cold soaking. 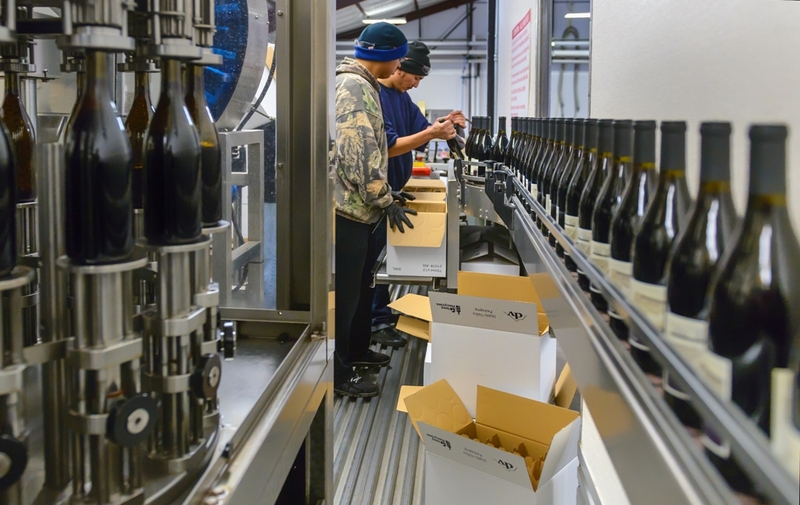 This also results in better logistical flow, planning and better quality of wines across the board. 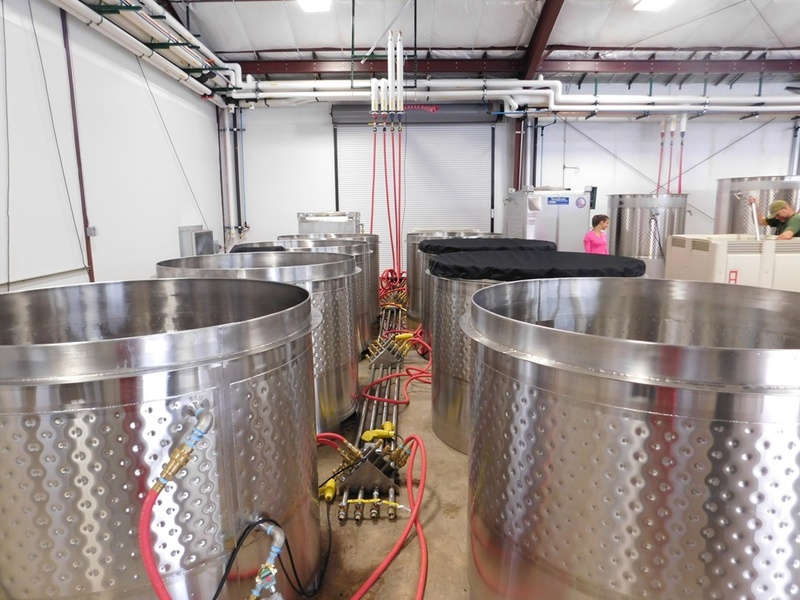 Naumes Crush also offers cold storage for growers and other wineries so they may benefit from these advantages as well. Growers will find it very useful for consolidating picks over time to a single shipment. 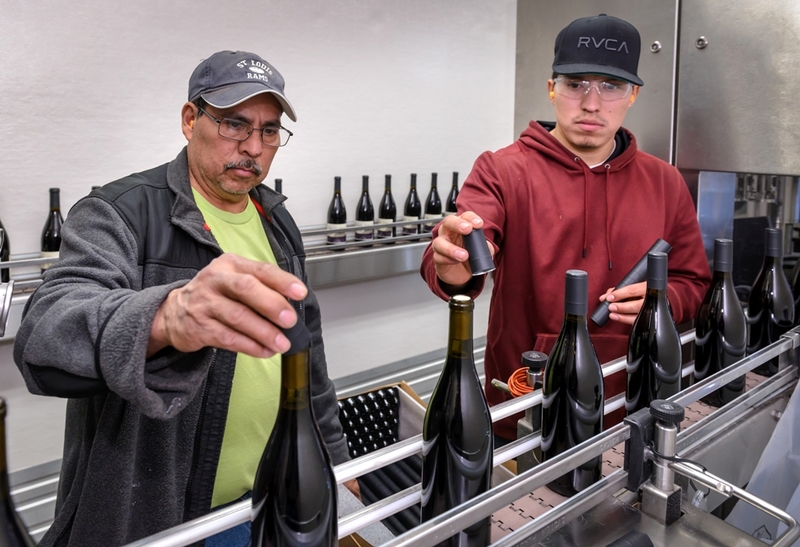 Wineries can buy time if they need to pick grapes but aren’t ready to process. 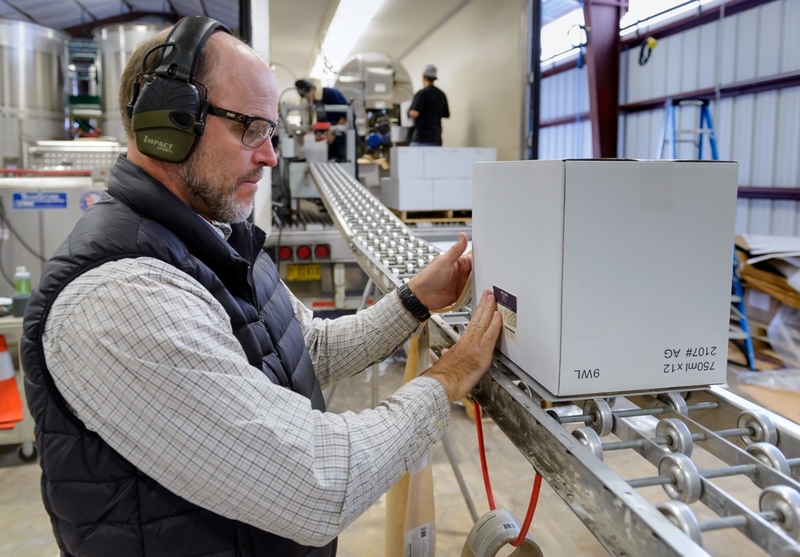 Indeed, cold storage is an incredibly valuable tool for the wine industry, and Naumes Crush hopes to elevate the quality of wines in the valley by offering this tool to its clients, as well as other growers and wineries in Southern Oregon. 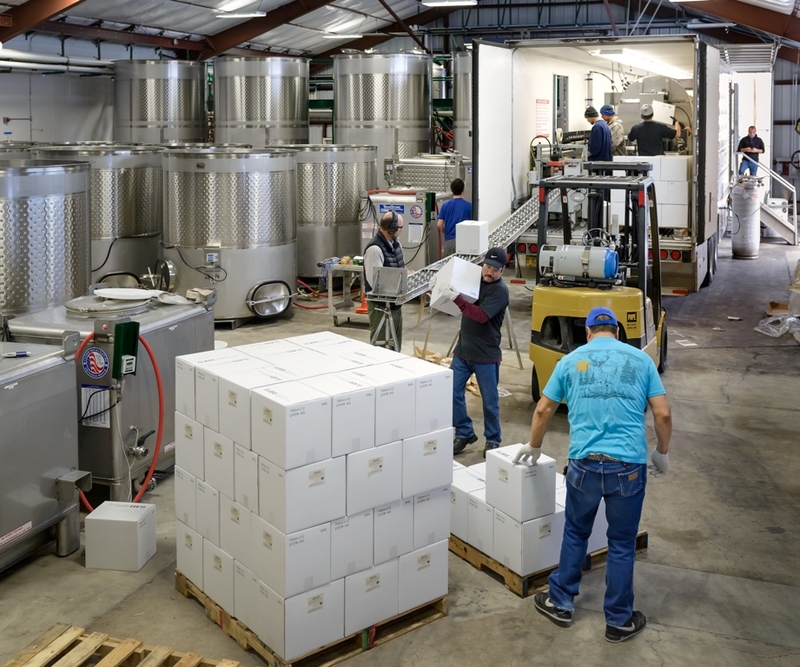 Please contact us if you have any questions about our cold storage options and availability for your winery. Notes from the Cellar: It’s Science Time! It’s after harvest and time to geek out just a bit. 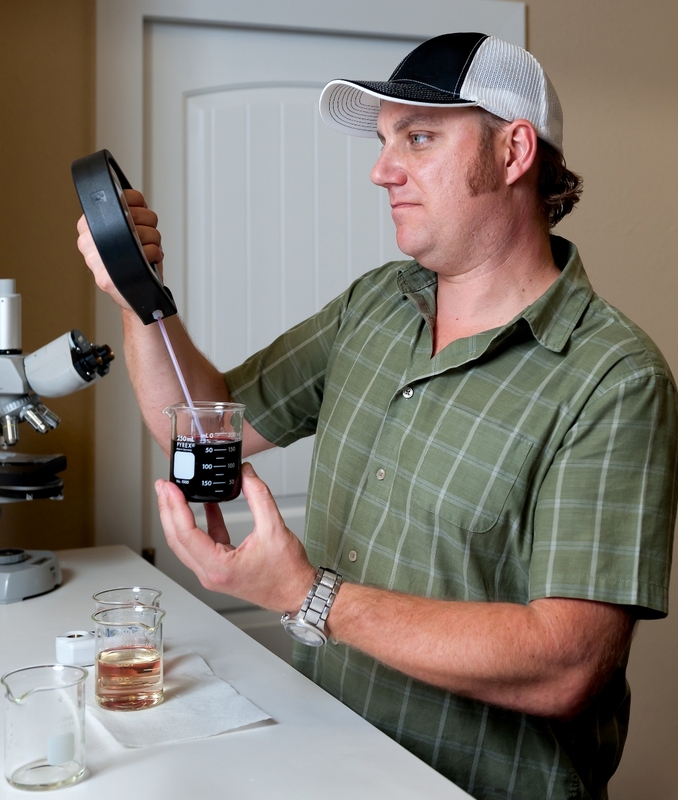 I love me my chemistry so let’s review some of the most common lab tests in making wine. Not to worry, no pop quizzes are involved. 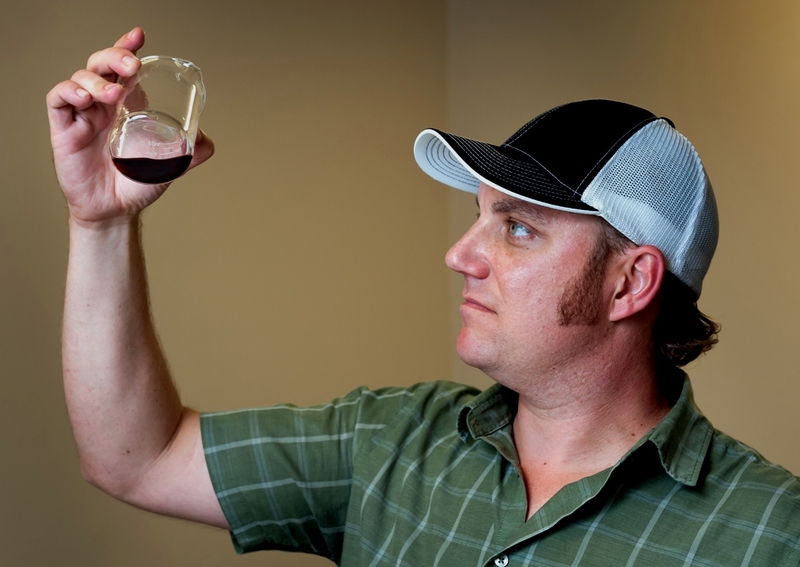 Sugar analysis is probably the most important and winemakers use “brix” in the U.S. as a measure of that. Yeast ferment sugar (glucose and fructose) into alcohol (ethanol), so we measure brix in vineyard samples to see how ripe the fruit is. We also track it as fermentation progresses. The next most important analysis is acidity, comprised of pH and TA. pH is the measure of the hydrogen ions in solution where water is neutral at 7, acids are lower on the scale, and bases are higher. Wine pH falls into the 3-4 pH unit range and has a big impact on color, chemical and microbial stability. TA is titratable acidity, essentially a measure of the organic acids in the wine. Those acids provide a sharp or sour-ish taste sensation and are very important in mouth-feel and wine balance. Another key test is for FSO2 – the measure of free sulfur dioxide. Sulfur dioxide is used as an antimicrobial and antioxidant, which is very important in keeping wine fresh and providing longevity. Without SO2, wine will quickly morph into vinegar. Volatile acidity (VA) is the measure of volatile acids, mostly acetic acid which is vinegar and formed by bacteria. 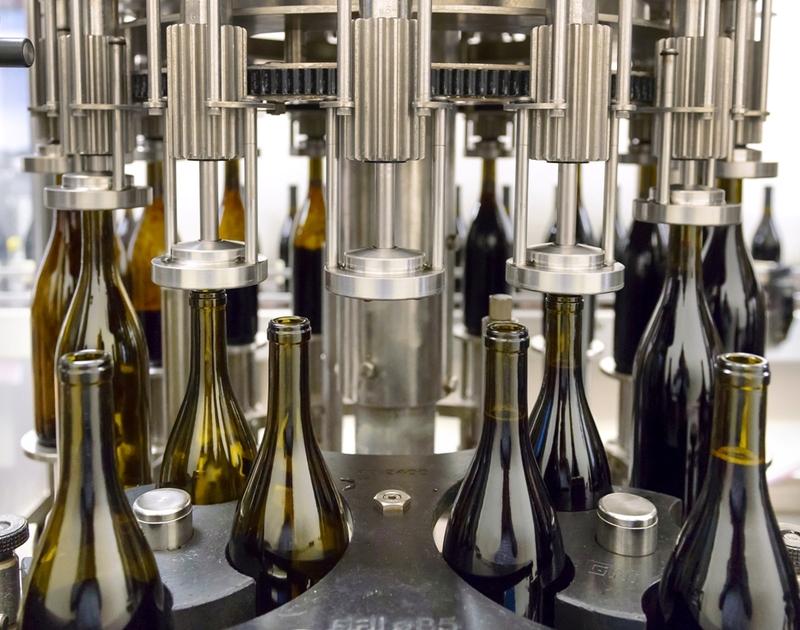 All wines contain a tiny percentage of vinegar (a fraction of one percent) but that number can explode if not properly monitored. Basically, we measure VA to observe potential spoilage. If it jumps, there could be a problem. Caught in time, though, a winemaker may have a chance to save the lot. Good, clean winemaking should result in lower VAs. But sometimes with higher-end, artisanal winemaking you need to take risks and push the boundaries of acceptable volatile acidity. Malic acid testing is another big one. Malic is a primary acid in wine (tartaric acid being the main acid) and is fermented by bacteria. Measuring malic allows us to get a fuller picture of acidity and wine stability. There are many more parameters to analyze, but we can’t forget alcohol level. My grandpa used to say about California Chardonnay: “The higher the alcohol, the better the Chardonnay.” Looking back to the first time I heard that, I think he was referring to the “warmth” and sweetness alcohol lends to flavor (which clearly he liked). But too much alcohol can make a wine “hot” and, yes, unpleasant. And, of course, we need to measure alcohol for regulatory compliance and tax purposes. 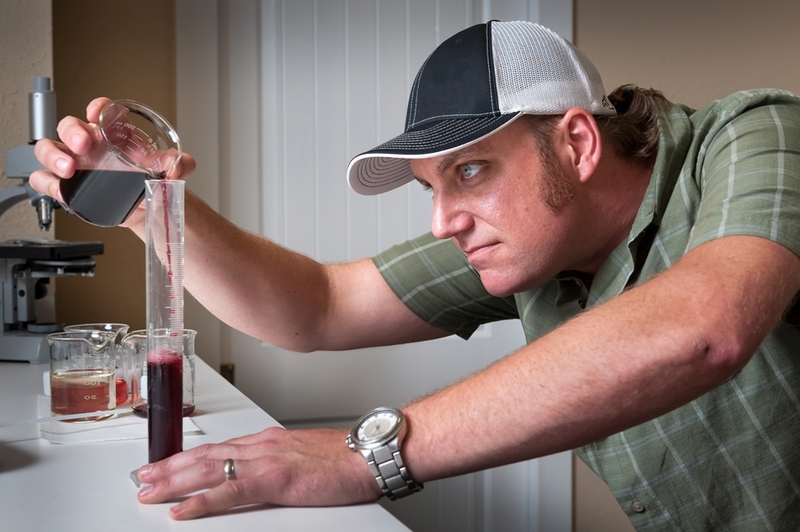 Yep, I believe these are the analyses all wine labs should run – and as often as needed. There are more chemistry options, but a winemaker’s best tools are still a good nose and experienced taste buds. Here are a few questions I get all the time. What’s your favorite test to do in the lab? Acid trials. This is where I take a wine sample, spike it with tartaric acid (or malic or citric), and look at how it affects the pH, TA and flavor/balance of the wine. This requires lots of tasting and it’s way fun to see how you can take a flat, tired wine and make it pop with flavor, fruit and life – all by adding a little more sourness. What makes the Naumes Crush lab stand out from others you’ve worked in? We’re semi-automated and this takes a certain element of human error out of the equation. And, in many cases, it allows us to get results faster. Quicker, more complete data helps me make far better decisions. What piece of equipment are you most excited to have? Hands down, our robotic spectrophotometric analyzer. What the heck is that? We use enzymes to create reactions, which we can see by applying a specific wavelength of light. This method is used for many evaluation parameters – including nutrient status for fermentation (ammonia and yeast assimilable nitrogen), malic acid and VA, residual sugar and much more. The cool thing is the robot does most the work and the results are precise and accurate. This type of analysis is time-consuming (unless you have a robot) and expensive. Most small labs don’t have access to this tool and will do work-arounds or outsource the analysis. Having it in-house gives us much more control and saves tons of time. Here is the first installment of our winery tour series documenting the process the grapes go through when they first arrive at our facility. 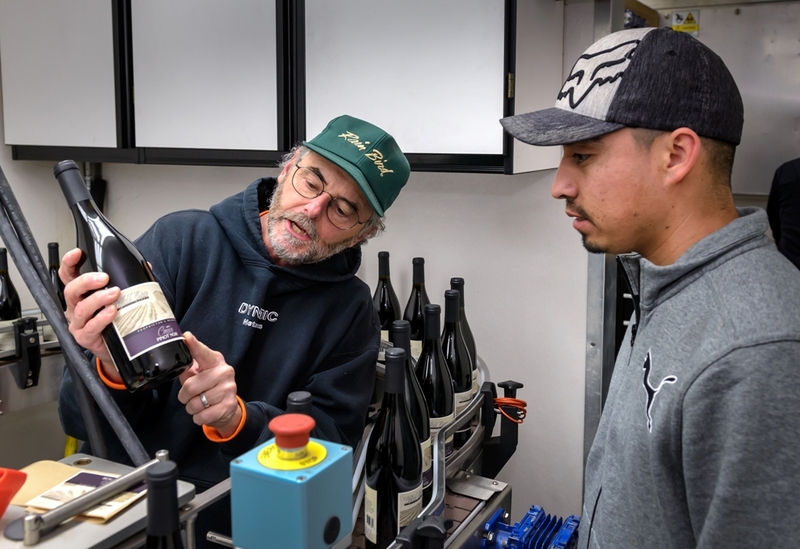 Our Winemaker Chris Graves shows us the state-of-the-art sorting line, including the optical sorter. 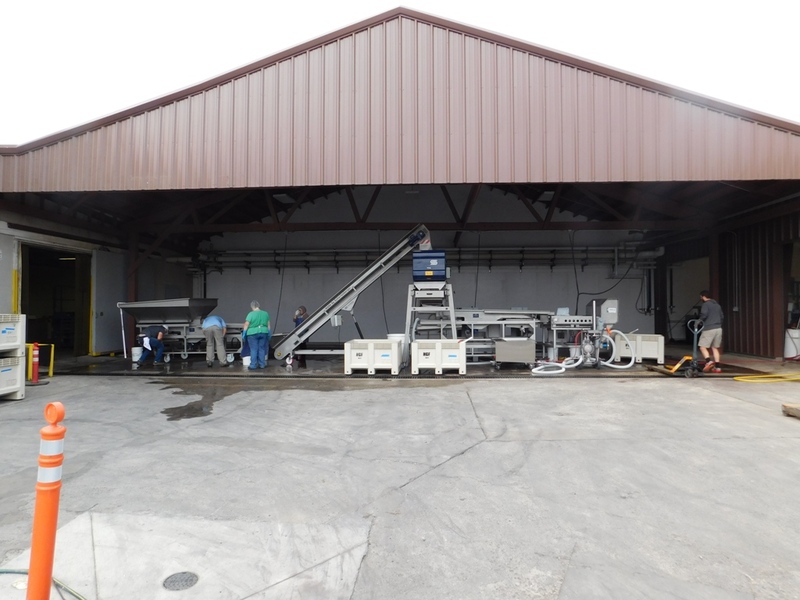 The excitement continues here at Naumes Crush an Fermentation. We are a few weeks into this season, and have already received around 50% of the grapes we have booked so far. Everyone is settling into their positions and we are running like a well-oiled machine. 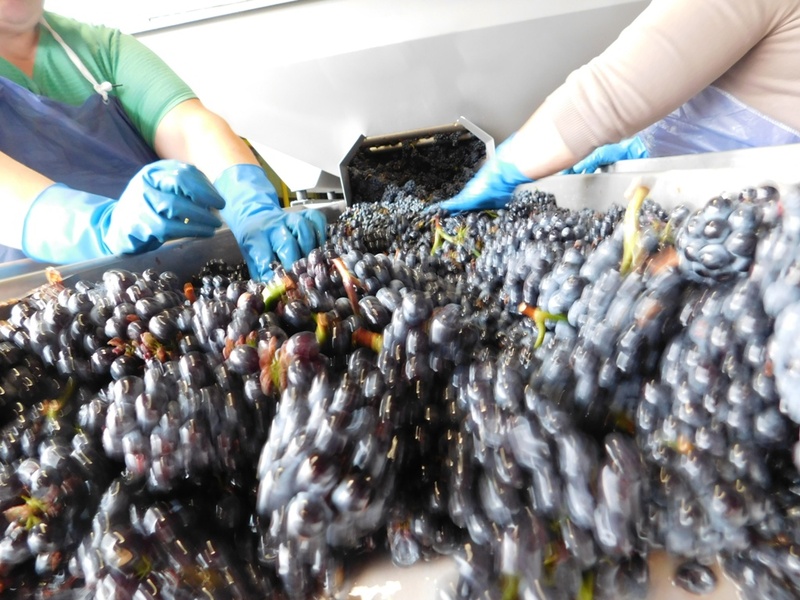 It’s truly fascinating to watch the grapes go through their journey on the sorting line, starting as fresh picked, full clusters and coming out of the optical sorter as beautiful clean grapes ready for premium fermentation. Around the facility all the finishing touches are being completed on the various elements. Electrical is finished, plumbing is finishing up a few smaller projects, and everything else is nearly 100% complete. 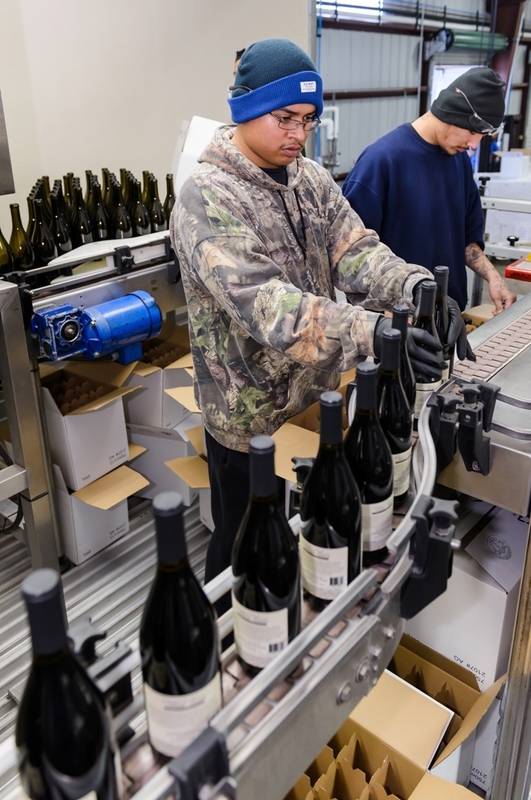 It’s been quite a journey for the facility, and it’s exciting to see it all culminating with the grapes starting their process to becoming premium wine. I’m hoping to get a video tour of the process filmed soon, and I’ll post that on here when I do. As you can see the facility has come a long way, and it’s really looking good now that we are in production. 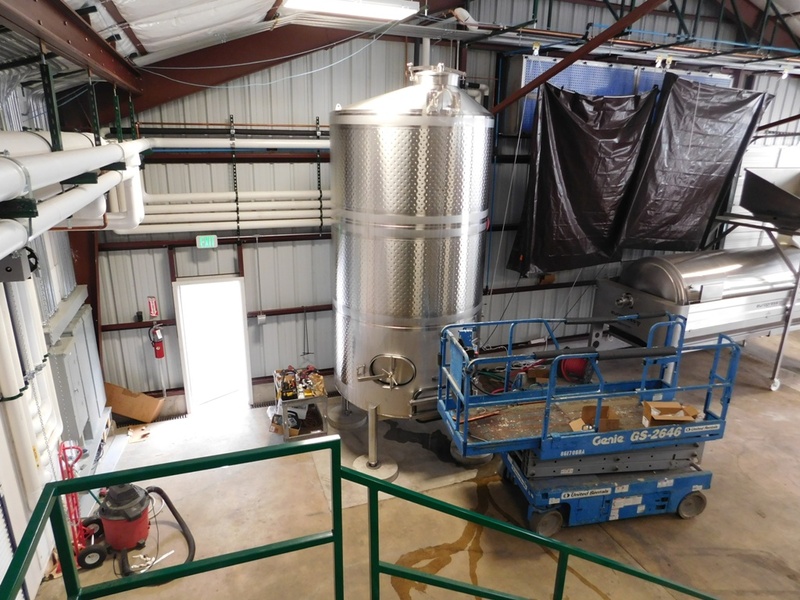 About half of the fermentation tanks are being used at this time, and we are still waiting on one more shipment of three-tonners. Here you can see our giant 3200 gallon tank. It’s the largest we have and makes the press look tiny in comparison! The plumbers had quite a job hooking all the larger tanks up to the glycol system. This is the view from underneath the catwalk. The two-ton fermenters are seen here connected to our “spider”. This allows for extreme flexibility on how many/where the tanks can be placed. Even the barrel room is starting to fill up! Here you can see our receiving/sorting area with all the equipment ready to go. The first step for the grapes. The sorters here are just picking out any leaves/ bigger raisin bunches before the grapes get destemmed. 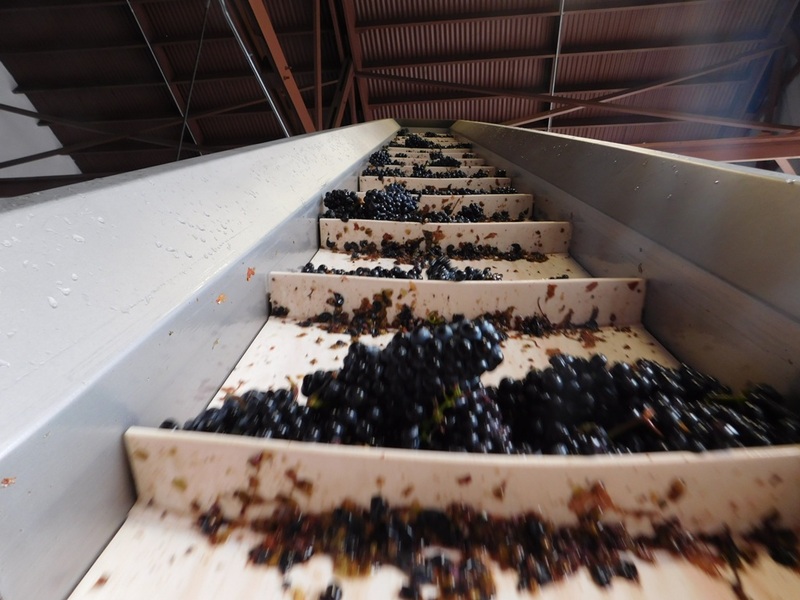 The grapes then ride the conveyor belt into the destemmer. 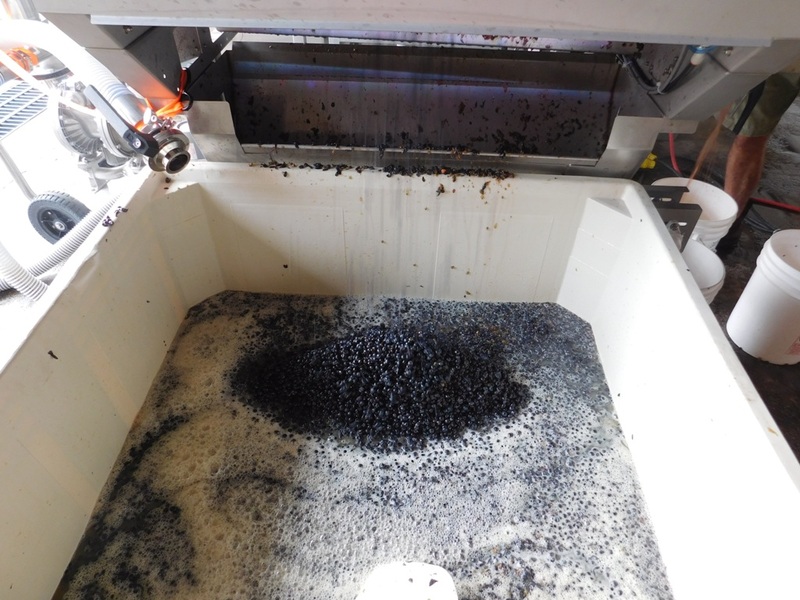 After destemming the grapes are run through the optical sorter. As you can see they are very clean, with very little MOG (Material other than Grape). 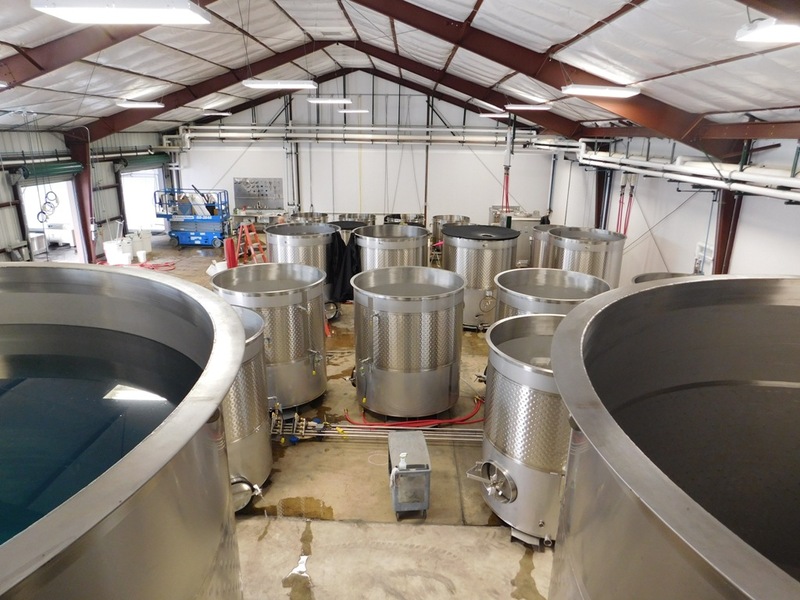 Most of the grapes finish their days journey in a fermentation tank, where they will leach color and flavor out of the skins, before eventually being pressed.